Reflexology is a science that deals with the principle that there are reflex areas in the feet that correspond to all of the organs and systems in the body. These points are worked on in specific manipulations while you relax. Having a Foot Reflexology treatment means more than working on your feet. It is actually working with the person, attempting to mobilize inner energies in order to restore balance in the system. 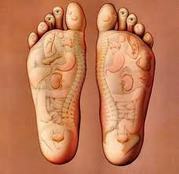 Foot Reflexology is not only relaxing but offers healing from a variety of ailments. The blood circulation and immune system will be boosted. The body's function will be naturally turned into its homeostasis. Competently perform a Foot Reflexology Treatment. Learn the therapeutic techniques of Foot Reflexology. Learn the different reflex points and the corresponding glands and organs of the body. Learn the benefits of Foot Reflexology. Learn about client conditions and practicing guidelines. Learn about reflexology with a brief historical look and an exploration of a reflexology session.